The holiday season is about to be upon us and we are kicking it off in a BIG. BIG way!! Baking and entertaining is so big this time of year that this Holiday Entertaining Giveaway is coming at just the right time! 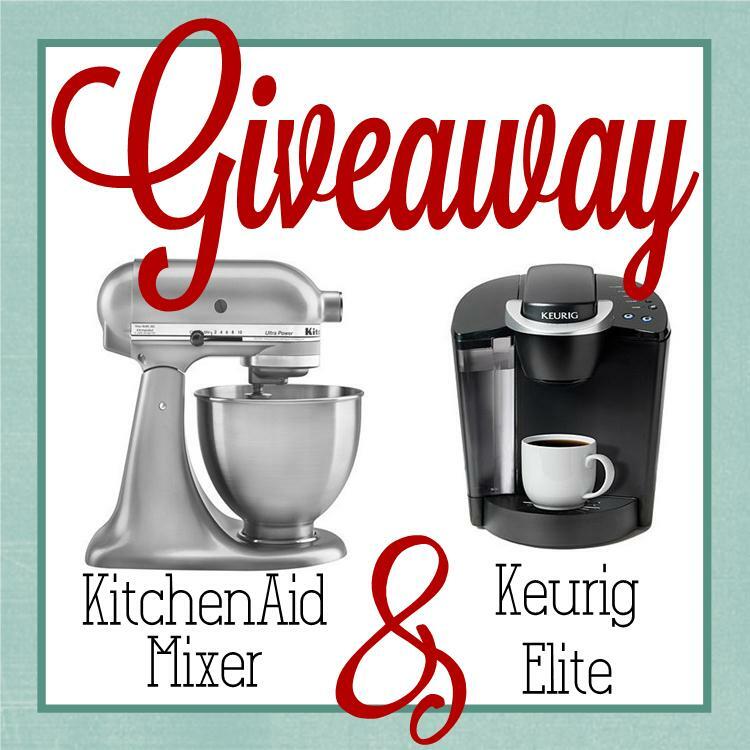 One lucky winner will win a KitchenAid Stand-Up Mixer & a Keurig Elite Coffee Machine! This elite group of creative bloggers listed below has teamed up to offer you this amazing Holiday Entertaining Giveaway! We are all lovers of food, family & holiday creating & we want to spread our Holiday cheer by offering this special giveaway to one of our readers! *Follow the guidelines in the rafflecopter box below. *Please make sure you do what is asked, because we will be verifying the winner and their entries! *In addition to the entries below, you also have the option to tweet about this giveaway everyday for additional entries! *It is very important that you do every single step. Don't forget! This giveaway will end in 10 days. It is our goal to get this Entertaining Giveaway to the doorstep of the winner by Thanksgiving week! I love to make this great lower calorie fudge! ( I know it's not baking, but it's great!!! I love to bake Christmas cookies to decorate with my daughter! Wow, what a giveaway!! Awesome girls, thank you! I love baking different X-mas cookies, like gingersnaps during the holidays. What a sweet and wonderful giveaway! I was asked the question of what me favorite thing is to bake during the holidays and I would have to say....cookies :) I love the smell of cookies baking and spices during the holiday time. Thanks for the giveaway! Thank you for the SPOOKTACULAR giveaway! So excited to be following you! My favorite is making a gingerbread house with my darling little one! Nothing better!! I love baking a French Silk Pie for Christmas! Pumpkin Pie!!! !And thanks for doing the givaway!! I love making truffles and pies! Peanut Blossoms - they were a favorite at my house growing up and now I get to make them for my own little family! I love making anything pumpkin and pretty much any other kind of dessert. I love finding new recipes to try. I like to make cookies & fudge! I like to make trifles during the holidays. This year I'm making individual ones in punch cups and wrapping them in celephane and tying a spoon to the top to sell for the Spouses Club at the Holiday Bazzar on Saturday. I love making red velvet cheesecake for the holidays! For the last few weeks I've been having visions of a caramel pumpkin pie though so I may attempt that this year! We have a recipe book filled with family cookie recipes. That is what we will be baking! Christmas cookies that have lots of frosting. I love to make hashbrown casserole and scotcheroos. Thanks for the op to win! cookies, cookies, & more cookies! Mercy me; you couldn't use these small appliances? I would dearly love to win. Pumpkin pie and pecan dark chocolate brownies. All Kinds of Candies!!! and Banana Bread! caramel apple cheesecake and all sorts of cookies. Pumpkin cheesecake and sugar cookies! My favorite thing to bake during the holidays is cookies, apple pie, and hot rolls! I love baking my grandmother's Rocky Road recipe. My Favorite thing to cook over the holidays is Pecan Pie!! Anything pumpkin...... but my favorite is pumpkin cheesecake! Oh gosh how to pick one? I will say a few, Soda Bread, Carrot Cake , and of course chocolate oatmeal cookies. My favorite thing to bake is my family's Cheesy Pineapple recipe. We only have it on Thanksgiving and Christmas, so it always reminds me of years past. It just wouldn't be the holidays without it! I love baking the desserts, Roasting the turkey all day smells wonderful but after everything is done and cleaned up, we sit down for round two with dessert! Pecan Pies, Cakes, cookies, candies, whatever I feel like making, and I always make too much! I alwaaays make strawberry trifle on Christmas eve! And a gingerbread house! My favorite thing to bake is chocolate chip cookies! Two things I like to bake during the holidays -- lemon tea cookies and rainbow cookies. Old-fashioned sour cream cookies. I've been making those since I was little with my mom & now I make them with my kiddos. Nonie's Frozen Salad is a must have at holiday meals. Love to bake cookies and pies during the holidays! I LOVE making apple praline pie!! My favorite thing to bake is sugar cookies and decorating them with my children. Thanks for your giveaway and all the awesome vendors.. lots of talent! I love to bake anything with pumpkin! My favorite thing to bake is Coffee cake for Christmas morning! I love to make coffee cake for Christmas morning! I would love to make some Christmas cookies..yum! All different kinds of yummy cookies! I love baking cookies & brownies! I love baking Christmas cookies and fudge with my grandma!